already in the fourth generation. It received its name from the former boat landing , where the local woodworkers already could let it go well with food and drink. Formerly associated with agriculture, we can today supply the farmers of the regional environment. The fish from our menu card are been caught by ourselves from the Lake. We offer a total of 30 rooms, as well as 5 apartments, where you are comfortably in the bright rooms with couch, relaxing on the terrace and Wi-Fi access provided, whereby you can spend the night. In our restaurant we have reserved a table for you, where you can take depending on your booking, breakfast, half – or full Board. You can choose from a 4-course dinner both soup/appetizer, main course, dessert and salad buffet. 2 swimming places, which can be used by our guests at any time on the sun loungers provided. we have a parking spot for everything. 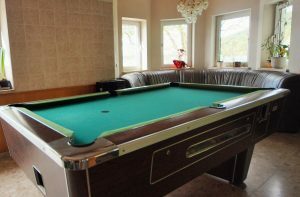 For our little guests we have a children’s playground , table tennis and table football, as well as a games room and collection. By boat renting, you can rent electric or pedal boats. On request, Bikes are available. For dives we offer a drying room and direct access to the lake. Fishing is free at the doorstep further you can go with our fishermen to net fishing. 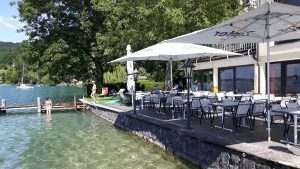 Or you can explore a variety of recreational opportunities around the Attersee . Our well equipped seminar room has a flip chart, TV set and DVD player. A WLAN access is also for the seminar visit available. 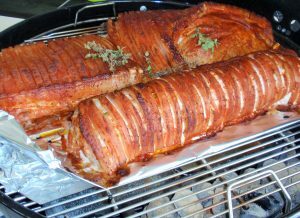 Then you can discuss with your colleagues and employees in a friendly setting with excellent regional food. We look forward, to welcoming you ! 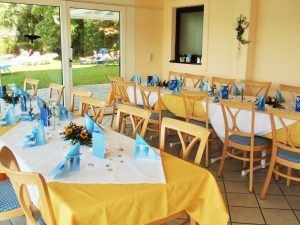 In our family-friendly guest house located next to Seegasthof and with 30 rooms and 5 apartments can accommodate up to 80 people. 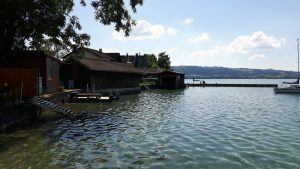 Our house is located on the eastern shore of Lake Attersee in a small bay and next to the lake with private beach and lawn. • The rooms mostly have a balcony and have a size between 22m2 and 29m2. • They are equipped with flat screen TV. • Wi-fi is available in the restaurant area and in all rooms. • Hand and bath towels for swimming or your sunbeds are provided. 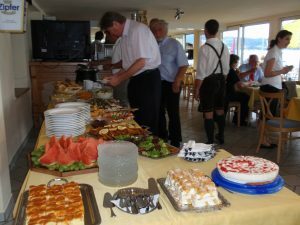 buffet breakfast and choice of menu for half board. 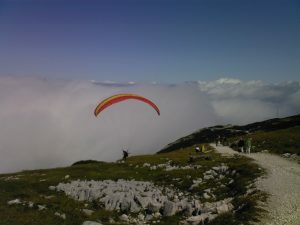 The peak season is from 05 July to 28 August. The off-season is reduced by 3,00 €. Apartment for 2 to 4 people with a partial view of the lake or hill side with balcony. They feature a kitchen with cooking facilities and fridge ( dishes available ! ) With sitting area and bathroom with shower and toilet. TV and Wi-fi access in all rooms . Change of bed linen 1x per week . The apartments are available upon request with breakfast and half board. Apartment for 2 to 4 persons with sea view . They are equipped with 3 rooms of which 2 separate sleeping areas , as well as the kitchen with cooking facilities ( dishes available ! ), Refrigerator and seating area. The apartments all have a balcony or terrace. Bathroom with shower and toilet. TV and Wi-fi access in all rooms . Apartment for 4-8 persons with direct or side sea view . They are equipped with 3 rooms, of which 2-3 separate sleeping areas , as well as the kitchen with cooking facilities ( dishes available ! ), Refrigerator and seating area. The apartments all have a balcony. Bathroom with shower and toilet. TV and Wi-fi access in all rooms . 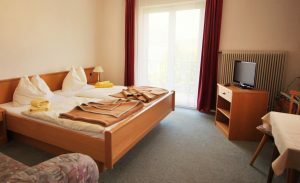 All double rooms can all be booked as single rooms. 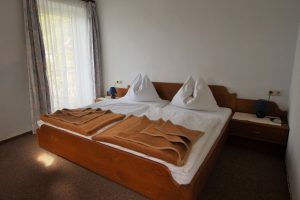 For this a single room surcharge of 5, – Euros calculated (rates in the double room categories). Our double room with view to the sea or hill side are mostly equipped with a tub shower. With special note also rooms can only be booked with a simple shower. Seating in the room and on the balcony. TV and WiFi access available in all rooms. Change of bed linen 1x per week. Bookable with breakfast and half board. Our double room with view to the sea or hill side are mostly equipped with a tub shower. With special note also rooms can be booked with a simple shower. There is seating in the room and on the balcony. TV and WiFi access available in all rooms. 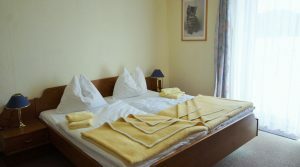 Bed and breakfast € 45,00 p. P.
Half-board € 65.00 p. P.
Bed and breakfast € 49,00 P.P. Half-board € 69.00 p. P.
During the off-peak saisons there is a price reduction for 3,00 Euro p.P. for each room. Our attic rooms all have lake views. Showers, and washing facilities are integrated in the room. A seating area and flat-screen TVs and WiFi access are available in all rooms. Bed and breakfast € 45,00 P.P. Half board € 69,00 P.P. During the off-peak saisons there is a price reduction for 3,00 Euro p.P. 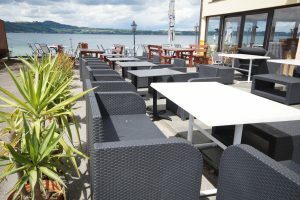 Restaurant with lakeside terrace right next to the Attersee. In our restaurant with lakeside terrace, we serve every day fresh fish, but also typical Austrian dishes from the region. In the morning we spoil our guests with an extensive breakfast buffet, and, also available, with a 4-course half board menu. Small snacks are served in between the times. Throughout the day you can choose from our range of homemade cakes and pies. 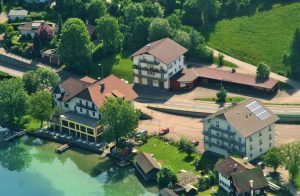 Take advantage of our many offers on the spot, or go on tour in the beautiful Salzkammergut. The beautiful Attersee, with its green forests, meadows and pastures all around, at that time already Gustav Klimt thrilled. 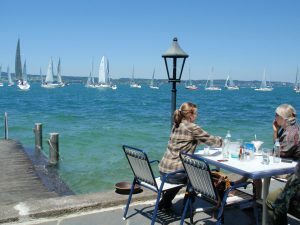 Whether relaxing , swimming at the ”Strandbad” or in one of the many beach resorts, whether walking or cycling to the various sporting activities , there is something for everyone . With up to 26 ° C in summer, the so wonderfully warm lake of the Salzkammergut lake region, ith inflow from Lake Mondsee and outflow in the Ager until finally in the Traun, a part of the lake with the cleanest lakes in Europe , offers its visitors lots of variety and action is offered in , on and around the water . Sunbathing at our natural beach on the private sun deck and the same 3 m from the lake . Chatting on the lake terrace with iced coffee , get to know people or read in peace a good book. Be the captain of one of our rental boats . In rainy weather, relax in the hotel’s sauna area. Fishing: Be there when our fisherman interpret or obtain their networks. Please register in advance on site. Fishing from the house jetty possible. Relaxing walks or hikes: Direct at our house begins the lake promenade wich ends directly at the village center. Allow about 15-20 minutes. Or would you prefer at the tree line with views of the entire lake, past a game reserve in the beautiful river valley? There is also the starting point for hiking on the Gahberg and Kreuzingalm. Shopping: 5 min away is a Spar shop where you can buy all the products of daily use. Sailing 2 minute walk from our house is the sailing school Weyregg, or something away another in Steinwand. Diving Weyregg has two diving schools Under Pressure or Nautilus . Drying area for diving equipment in the house. As a little treat: The dive sites on the Attersee are reported outstanding by synoptics , a catalog is made on site. Cycling either through the woods by the river, or the lake in the emerging bike path. Bikes on request. River diving and scuba diving in the Traun ( highly recommended!) – In the footsteps of former Salt Road , crystal clear water , fish and cancer guaranteed! The Austrian painter Gustav Klimt has the Attersee explains to his adopted home in order here to recover from his stressful day of Vienna’s city life. No wonder that most of his pictures were taken here. In his honor, has in the neighboring Seewalchen now the Gustav Klimt center opened ( directly from the pharmacy) , where in addition to his paintings and life also a meticulously designed film about Klimt and the Attersee is shown. The Atterseeschifffahrt has taken a theme ride to the haunts of the painter in their program. On Gustav Klimt way you can explore the history of Klimt himself , or take part in one of the guides . Vöcklabruck: next to the Baroque city center , every Wednesday and Saturday farmer’s market takes place here. Numerous cafes are located along the town square , as well as many clothes , leather and bookstores . Visit also the Knopfcenter, where you can leave buttonless clothes also defective zippers for repair etc. Open -air events , such as concerts, operas , etc. complete the offer of the diverse city . Gmunden: home of the famous Gmunden Ceramics Factory , which you can buy from the factory here . Stroll down the beautiful promenade , look into the shop windows quaint costume shops . In our 45 minutes away Linz, the capital can be in the Höhenrausch walk over the roofs of the town and the integrated museum. A water experience area offers a fun variety for young and adult children. Another attraction is the Poestlingberg with Grottenbahn and Basilica or the Ars Electronica Center. Bad Ischl: The former imperial city is located just 40 minutes from us . Have an impressive experience in one of the guided tours of the Imperial Villa as Sissi and Franz yesteryear have lived . The Café Zauner loads already with his display of various delicacies to a marvel . Or how it would be in the evening with an operetta at this year’s Lehar Festival 2014? If it rains , the salt water bath is well worth a visit! 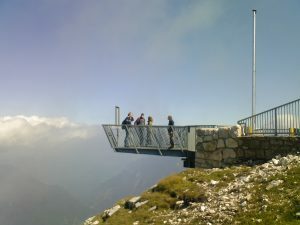 Schafberg Climb the mountain with startingpoint in St. Wolfgang with the oldest cog railway in the world, or walk up from the Attersee through the gates of hell. 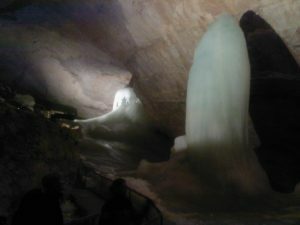 Dachstein Eishöhlen In addition to the ice caves , you can also visit a limestone cave . Then straight on the cable car to the 5 Fingers. 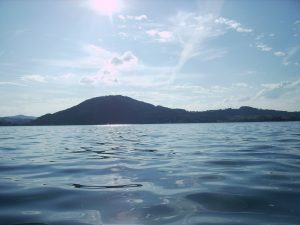 Discover the Attersee! Accompanied by the renowned and experienced diving company ‘Under Pressure’, you will be able to enter the lake directly from the hotel. New! Start your diving adventure into the lake directly at the hotel. „Gemma tauchen“ (Let’s go diving!) – that’s the slogan of our professional diving instructors/provider ‘Under Pressure’ at the Attersee. Directly at our hotel, ‘Under Pressure’ offers you the possibility to discover the depths of the lake – at an optimal price-performance ratio. In the evening you could enjoy a relaxing come-together with locals and guest divers to exchange your experiences directly at the diving base: your accommodation. Benefit from our package offers of accommodation including diving course and unlimited compressed air from the air dispenser directly at the hotel. We charge per consumption (€ 0,50 per liter) – and not, as usual, per complete filling. This allows you to have always perfect control of your expenses. One week-end at the lake including 3 days of diving and 2 overnight stays, breakfast, usage of the drying room and unlimited compressed air. One overnight stay including 2 diving days, breakfast, usage of the drying room and unlimited compressed air. 3 overnight stays including diving course, breakfast, underwater equipment, course materials, certification fees (diving license), drying room and unlimited compressed air. Notice: no hidden fees for course materials and certification, high level of training, 1 diving instructor with 2 students maximum. Special courses with overnight stay included. Available for the following courses: Orientation, Dry Suit Diving, Nitrox, Guided Groups and River Diving. All our offers are guaranteed to include no hidden costs like such as additional course materials and certification fees. Accompanied by our experienced diving company ‘Under Pressure’ you have the possibility to discover a fascinating feeling of weightlessness and calmn under the water’s surface. Depending on the weather you could participate in a trial diving in the lake or an indoor swimming pool. You will be equipped with a complete diving equipment and be trained by a diving instructor. You will learn to ‘fly’ and ‘breath’ under the water guided during the whole course by your diving instructor. 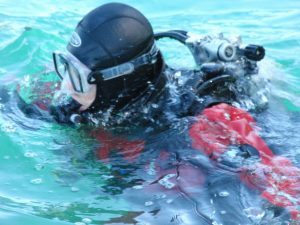 Trial diving courses take place at the lake every day at 10:00 and 14:00. You may register at the hotel or directly at the diving company at office@up-group.at or via phone +43 650/8000477. 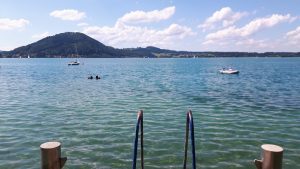 The Landeroith Inn at Lake Attersee – the perfect place for your diving holiday!